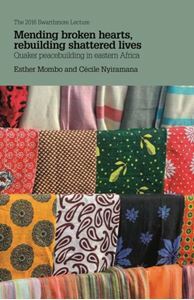 The lecture will give a flavour of Quaker peacebuilding work in five countries in East and Central Africa – Kenya, Rwanda, Burundi, DRC, and Uganda. Over the last twenty years these countries have experienced internal conflicts. These have differed from country to country in their severity and their length, and some are still ongoing. Quakers have been directly affected by these conflicts, and have been challenged to respond. Esther and Cécile will speak of that response and the difference they believe it has made, along with the contribution of others. There have been some inspiring leaders, and the lecture will tell some of their stories. In their work Quakers have drawn on peacebuilding tools that were already in existence and developed some of their own, and the lecture will tell something about these. Esther and Cécile will also share several general themes in this work, which seem to be applicable far beyond the countries they will speak of.